Cook the Petit Pan Roll according to instructions & allow to cool fully. Meanwhile Peel & Chop Potato into chip shapes & place on a plate in the microwave for 3 minutes. Remove & place on a baking tray sprayed with sprayoil in an even layer. Bake in a preheated oven at 200c for approx 25 to 30 minutes until browning & cooked through. Meanwhile split the petit pan roll lengthwise with a sharp knife. Mix the Passatta & Puree, some oregano & salt & pepper well in a bowl, spread liberally over the petit pain halves. 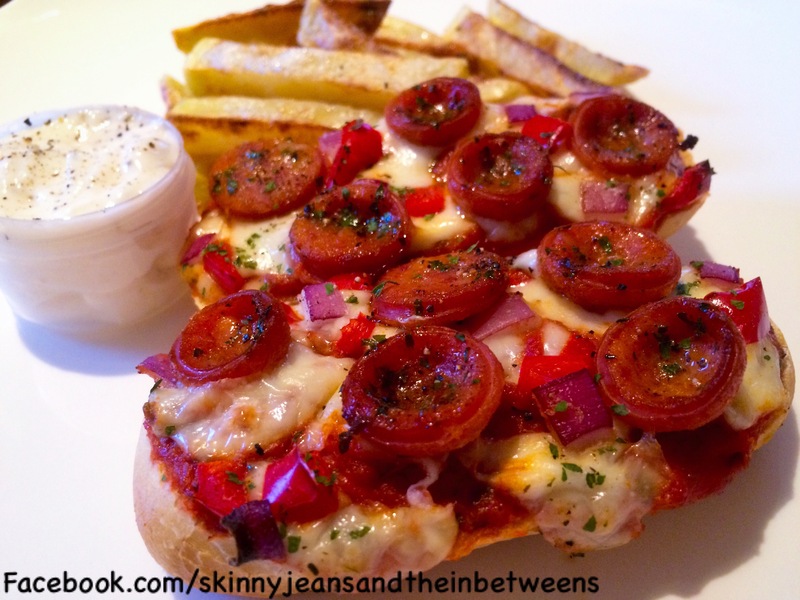 Top with the Mozarella, Finely diced red onion & pepper & the Pepperoni sliced. Season with black pepper & dried parsley & cook in the oven with the chips for the last 15 to 20 minutes until cheese is melted & pizzas are hot. Mix the Mayo with some crushed garlic (you may not want to use a whole clove if only making this recipe for one) & some black pepper. Serve & Enjoy!